Get ready for paper flicking and fist pounding! Ace Attorney finally has an anime! It will cover the first two games. You can watch it on Crunchyroll, but if you don't have a Premium account you have to wait until a week to watch the new episodes. If you can't wait like me you can find it on kissanime. FYI the English subs use the Japanese names. I really hope this gets an English Dub. I enjoyed watching it. I know some fans might not like it. After my experience with the Dangan Ronpa anime adaptation I feel a bit skeptical about this kind of game being adapted into an anime. They really glossed over the investigation phases on that one, which imo are just as important as the trial phases. There's so much important dialog that I'm kinda curious how long it would take for a single case to be portrayed in anime episodes. Just one trial phase can take over an hour to play, especially near the end of the games. And since this is made by the much loathed A-1 Pictures studio, not many people are having faith in it. I really don't mind them tbh, I haven't seen anything of theirs that I'd consider BAD. Yuki Kaji (Phoenix/Naruhodou) is a voice actor that I've heard a lot of complaints about, and saying that he doesn't suit the character in this case. I have no experience with him so I have no opinion on that. Aoi Yuuki voicing Maya on the other hand I have mixed feelings about. Kinda wish they would have just made an Ace Attorney anime with all completely original stories, like a Detective Conan type thing, instead of telling the exact same stories from the games. But I'll give it a shot and see what happens. I would love to have original cases, but this is the first step. There's a manga with original cases so I can see it happening. I'll take what they give me. Overall I enjoyed the first episode. I thought everyone sounded great, but this is coming from a person who doesn't care about voice actors. I judge the anime I watch by the characters themselves and the story. Voice acting and animation are on the bottom of my list. I will say this I will not watch anime with characters who have super high pitch voices. I stopped watching Precure seasons due to the mascots' voice acting. As for the episode itself. I expected the first case to be one episode. There's no reason for it to have two parts. I'm sure the future cases will be spread out more. I don't think it will be like the live action movie. I guess find this more enjoyable because I was disappointed with the live action movie. Now that I've seen the first episode, I can say that I don't mind it. It started out painfully cliche to the point that I expected Phoenix to run to court with a slice of toast in his mouth. And that backpack. XD Can't afford a briefcase, Nick? But as it went on it did a pretty good job of telling the first case's story without feeling like it messed anything up. Speaking of painfully generic, how about that OP? It's like... a law that the protagonist/s have to be seen running to the side in an OP. But when the protagonist is wearing a blue business suit it just doesn't look right. And that "golden chain of fate" thing? Symbolism! I don't think it was necessary to recreate the game's effects so directly. They could just show the names of places and times without using the straight out of the game text box, but I don't think it hurts the anime in any way. It just kind of enforces comparisons, instead of letting the anime be its own thing. I have no experience with Yuki Kaji, so I didn't mind him as Phoenix at all. Mia has a nice voice and even Winston's is good. 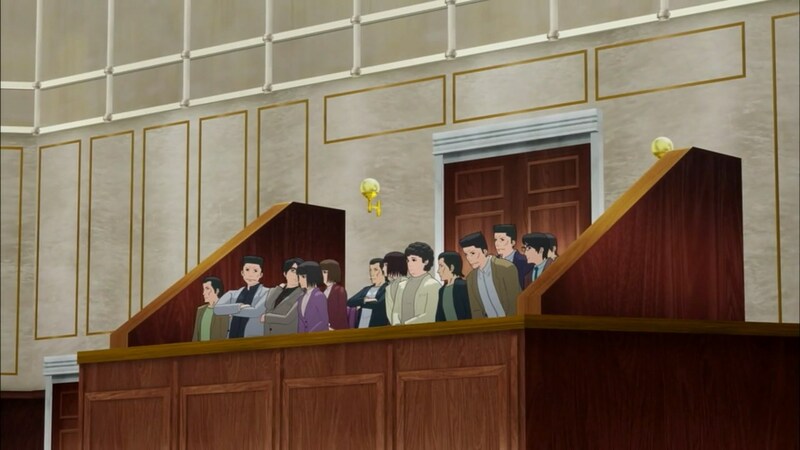 Aside from the really bad CG panning around the courtroom, the animation isn't bad at all. It's nothing to write home about, but it's not OMG SO TERRIBLE A-1 IS THE WORST STUDIO or anything. After seeing the modern works of Toei and Shaft, I have no problems with A-1. I do however think that certain liberties should have been taken with character behaviors. The culprit in the first episode has such bizarre movements that are clearly trying to mimic the games, but they just look strange. I'm surprised he didn't throw his toupee! Kinda weird how his voice throws Phoenix against the podium. I never thought of "damaged" animations in the games as them literally taking damage. All we need now is a life points counter and a portal to the Shadow Realm. I don't even know what to think of the ED, other than OF COURSE it had to be centered around a female character. That's just a thing with those sequences. Gonna keep watching and see where this goes. The first case was relatively short and had no investigation phase, so who knows what the others will be like. As I recall, the first game is the only one with three investigation and trial phases per case, so I imagine they'll trim those down. I feel like later cases will be more spread out. The first case is just a tutorial and sets the mood for the game. So there's no reason for it to have more episodes dedicated to it. I am so glad they are showing the game stuff! I want to see the OBJECTIONS! AND THE TAKE THATS AND THE HOLD ITS!! IT WAS JUST BEAUTIFUL TO SEE THE OBJECTION!! It got my blood pumping!! Second episode is tomorrow! I can't wait to see how they handle the big cases and the investigations. Obliviously things are going to be streamline. There's no way they will cover all of the games' dialogues. Episode two! It was great! I love Maya's voice! It's so cute and it fits her. Miles's car was totally badass! Looks like we're getting things spread apart! Although the next episode says trail 2 so I wonder if it will contain second investigation and the second trail. Haaaaaaaaaaaate Maya's voice, so much. Gumshoe and Edgeworth have great voices though. Interesting that Mia seems to be talking on a cell phone in the anime adaptation. Makes me wonder how someone could get ahold of that and place a wiretap. One of the earliest parts of the case involved examining the phone and noticing some screws were loose. Also, Edgeworth has both the Steel Samurai figure and the King of Prosecutors trophy, both of which he shouldn't have received yet. The localization added to the subtitles is funny. Maya clearly says "Miso ramen" when the subs say "burgers". Hopefully they won't ever show Maya eating her favorite food, or there'll be a contradiction slapping the subtitles in the face. At first I thought the girl in the flashback with the umbrella was supposed to be Mia, which would have gone against the third game, but then I noticed she didn't have the mole. All in all not a bad episode. This investigation was more about the character interactions even in the games, so the receipt and the wire tap are the only really important pieces of evidence, beside the autopsy report. Whats wrong with Mayas voice? I thought It was cute. I hate Aoi Yuuki's voice in general, so I'm pretty sure it was destiny for me to dislike her voice as Maya. I had hopes because when she voices Riko in Kiruminzoo, and I actually kinda liked her voice in that. Instead Maya sounds almost exactly like Madoka, which I feel doesn't fit her quirky character very well. 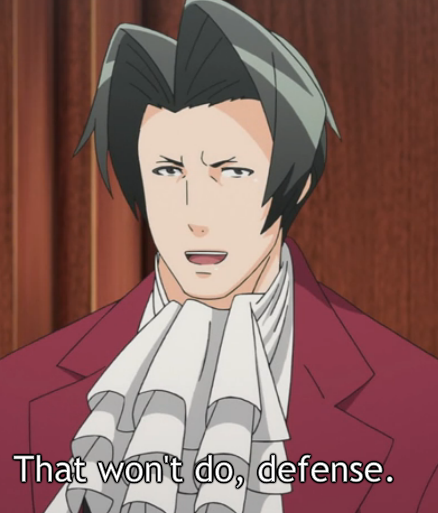 Also, one thing that dawned on me, the scene where Phoenix decides he wants to defend Maya. In the original he makes a heartwarming speech about how he won't abandon her, leaving her very touched. I wish they had kept it that way, instead of having her make the request at the same time and then turning it into a comically heartwarming moment when they both bump the glass. They cut out the part where Maya recalls her sister saying she'd be screwed if Phoenix defended her so early in his career too. Not a necessary scene, but it did kinda highlight the impact of Phoenix deciding to defend her against all odds. Oh. Again I don't care about voice actors. I like the change. Phoenix going around town looking for new lawyers showed her how much he cared and changed her opinion on him. The bumping on the head scene was cute and showed how dorky they both are. I thought it was very heartwarming. I hope for more changes like this we can't have everything be 1 to 1. It's actually getting to be kind of fun spotting the different changes between this and the game. So far the changes don't really hurt the story in any major way, in my opinion. For example, aside from some dramatic tension, I don't think it was necessary to call the Bellboy as a witness, so having that cut out wasn't too big a deal. It did feel a little fast though, having the entire trial and second investigation phase covered in one episode. Makes me wonder what longer cases are going to be like. Although, I'm glad they didn't focus on April too much. And I do think the way they made the updated autopsy report scene so comical was a little... meh. The prosecution playing dirty is never really treated as a joke in the games. I'm surprised they had Grossberg hand over the sunflower painting, but never had it pointed out in the show. It seems like the kind of detail that unless you've played the games, you might not really catch. So apparently it's White's thing in the Japanese version to speak random bouts of bad English. It's actually kinda funny to hear. At least now we have the whole next episode to focus on the trial. If they do Turnabout Samurai, I won't be surprised or bothered if they trim it down to two investigations and trials instead of three. Well they need to cut some stuff because otherwise episodes would be an hour long. There's so much dialogue in these games. Nice episode. I'm enjoying this anime. April May was hilarious and so was Redd White. How I love bad English in Japanese shows. They're doing Samurai. The anime is covering the first two games probably another reason why they are cutting some stuff. I was reading the TV Tropes page for the anime and this was pointed out. I only watched the OP the first time and didn't notice it. 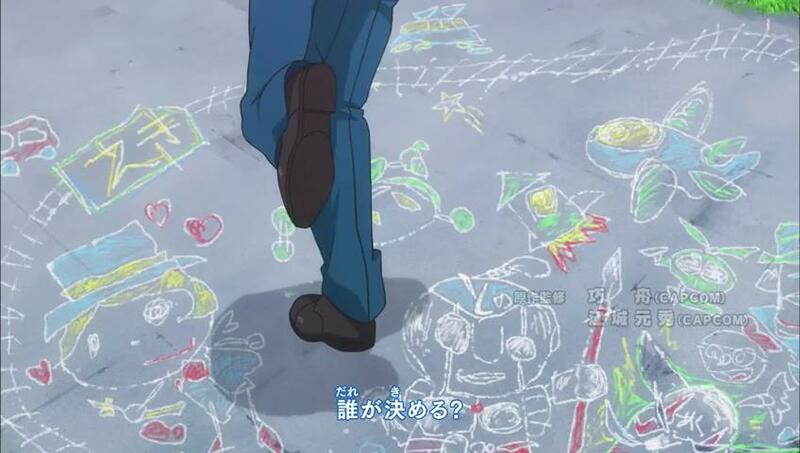 For the folks who aren't familiar, the chalk drawing on the left is Phoenix's adopted daughter, Trucy, who doesn't appear until the fourth game. Interesting that they'd include visual fanservice from that far in the series. This looks like one of those parodies of anime where they have a character repeatedly doing the same pose while the background moves to convey a dance or a fighting move. I was warned about A-1, but I didn't think it would be that bad. XD Now I know. Combine that with the rushed pacing and lack of Phoenix's sarcastic monologue, and I'm starting to see why people are criticizing this show so much. Also is it just me or are they trying too hard to make Maya into a typical sweet natured moe girl, instead of the ridiculous quirky goofball she is in the games?